Takeaway: This series is very good at keeping it fresh and mixing science fiction and fantasy elements. I swear this is not going to become a young adult review blog. But I seem unable to finish anything else lately. I believe I am in the midst of being brain fried. In spite of being unable to concentrate on anything remotely theological, I have enjoyed Artemis Fowl. In the Lost Colony, we discover that there are another family of fairies, the demons (we already know about elves, dwarves, pixies, etc). When the rest of the fairy families went underground to escape the humans, the demons moved their island across time and space. But occasionally the magic that moved them brings one demon back for a short visit. And Artemis has figured out how to predict those visits and that the increasing regularity of them means that the demon magic is breaking down and their island may be lost forever. Demons in this story are violent and aggressive (or most of them are) but not evil. 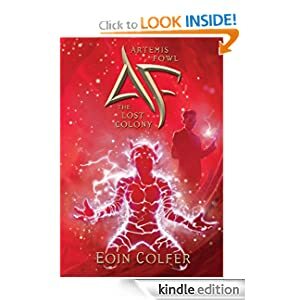 This book explores insularity that Artemis (and some new brilliant characters) face by being both smarter than everyone around them, and a little too sure of themselves. This was a solid, but not great addition to the series. It moved the story along well (the series has been very strong about keeping a fresh story), moved into realms of more traditional fantasy concepts. But while I enjoyed it and am going to start book six very soon, something seemed to be missing in The Lost Colony that made it a bit less than other books in the series.